And yippee today was the day to get one (sugar fix). I have been meaning to post this since this morning but we are having terrible internet connections these days...off/on/off/on...enough to drive you crazy! These cookies may not look like the ones you will find on the shelves of professional decorators but this is what you get for working with a dinosaur, two knights, a mermaid, a pirate and a zebra...yes, we had a slight chance of costume programming! We took the kids trick or treating on an old golf cart with a trailer attached to the back and they had a great time! In the bowl of your electric mixer (or with a hand mixer), beat the confectioners' sugar and meringue powder until combined. Add the water and beat on medium to high speed until very glossy and stiff peaks form (5 to 7 minutes). If necessary, to get the right consistency, add more powdered sugar or water. To cover or 'flood' the entire surface of the cookie with icing, the proper consistency is when you lift the beater, the ribbon of icing that falls back into the bowl remains on the surface of the icing for a few seconds before disappearing. Sometimes it's good to just bake with the kids and be one again! Yes, Halloween is here. It is kind of a new holiday for me and even after 10 years of being here, I still enjoy playing dress up and waiting for little goblins and witches to knock on my door. You can see the excitement in the kids' eyes as they prepare their costumes and have them laid out on the bed, ready for their big day. You can sense that pre-sugar rush as they get ready to go trick or treating. Seems like we are going to have a small Halloween block party with sugar, chocolate and a hay ride around the neighborhood. 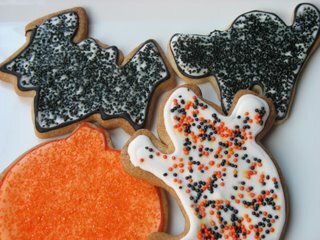 After SHF, I spent most of the weekend baking and decorating Halloween cookies and I can say that after many dozens of pumpkins, ghosts, bats and cats that I have no desire of becoming a cookie decorator. The novelty wore out after the first 2 dozens. My fingers are covered in orange, black and green food coloring. I believe I have more sugar sparkles in my hair than Dolly Parton has sequin on her dress, but that is for another post! No Halloween would be complete without carving a pumpkin. Problem is, I got one much more for getting the flesh and seeds than for the carving itself so my design remained minimal. I only had one thought in mind: I wanted to make pumpkin seed brittle as I thought it would make a nice edible garnish to a warm slice of Apple Cinnamon Cake. My mind kept on going and I thought that ice cream would be great with it too, but not necessarily vanilla. I was browsing through Dorie Greenspan's Baking: From My Home To Yours, when I found this incredible ice cream recipe. It is smooth and creamy, caramely but not too sweet. It was good enough to eat on its own but incredible combine with the cake and the brittle. Stir the sugar and water in a saucepan and cook over medium heat until the sugar dissolves. 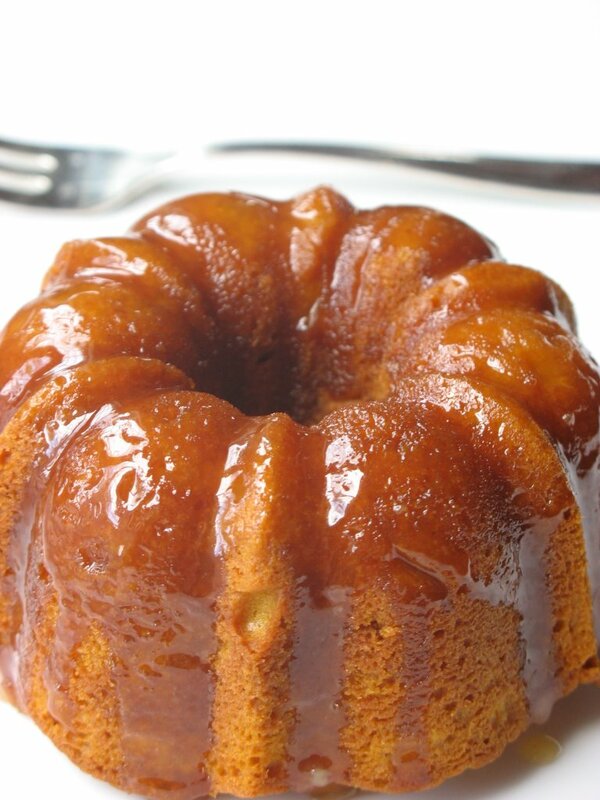 Increase the heat and cook until it becomes a caramel of deep amber color. Lower the heat and add the milk and cream. It will bubble like mad but continue stirring until it is smooth, remove from the heat. In a large bowl, whip the egg yolks and salt until a little thick, slowly pour the hot milk mixture over it and whisk to tamper the yolks. Put back into the saucepan and cook until it coats the back of a spoon (creme anglaise consistency or 170 degrees F). 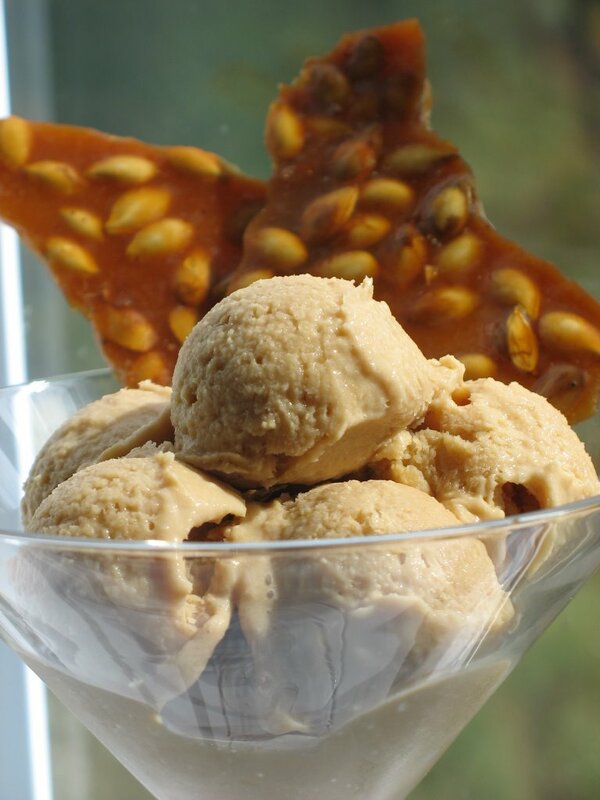 Let cool completely and churn into your ice cream maker. Freeze for 2 hours or moreor until firm to scoop....if you can wait that long! Preheat oven to 350°. Butter an 11-by-17- inch rimmed baking sheet; set aside. Melt butter in a small saucepan over medium heat. Stir in sugar and honey. Bring to a boil. Cook, without stirring, until mixture is medium amber and a candy thermometer registers 280°, about 6 minutes. Stir in pumpkin seeds. Cook until mixture reaches 300°, about 2 minutes. Pour onto prepared baking sheet. Let cool completely. Break into pieces. Yes, I have a difficult relationship with bite size desserts, also known as mignardises or petits fours. I love them and I dislike them. I did not want to use the verb "hate" because I can't truly hate anything sweet that passes through my lips. I love them because one or two bites and hop! you can get on to the next one. They fit in one hand, you can carry your drink in the other and still be able to dance around at a party, not that I have ever tried . I love making them: playing with the bases, the fillings, the decorations. I love working assembly lines for a while. I love eating them. And there you have it, the base of my dislike for them: I know no restrain when it comes to petits fours, bite sizes desserts and their numerous cousins! I always end up eating more than my share and feeling a wee bit of guilt. Thankfully, this feeling never lasted long enough to prevent me from eating them again! When Jeanne from Cook Sister posted the theme for Sugar High Friday #24, "Little Bites of Delight", I got nervous. So many ideas popped in my head, the excitement of the task at hand, mixed with that fear of eating them all before others have the chance to try them. I divised a plan: I would tell the neighbors precisely what I would be doing that Friday and invite them all for a little dessert party as soon as I'd be done with taking pictures. Guess what? The plan worked and we all had a great time, and I think I have finally mended my tough relationship with the morsels. 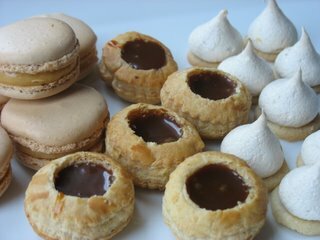 For the occasion I decided to go with 3 bite size desserts: Meringues Kisses, Caramel Vol Au Vents and Macarons filled with Honey Buttercream. They did not require me to purchase anything too fancy as it was pouring rain all day long and I did not feel like driving around. All the components can be made ahead of time and assembled last minute. 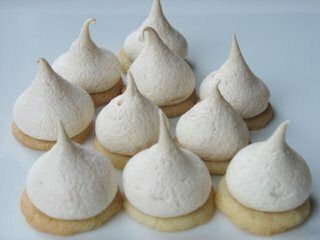 Meringues Kisses, adapted from Flo Braker. Cream butter and sugar, add flour and salt. Divide the dough in half in between sheets of plastic wrap and pat to 1/4 inch thick. Refrigerate until firm. Preheat oven to 350. Line baking sheets with parchment paper. Remove one package of dough form fridge and peel one sheet of plastic. Using the wide end of a pastry tip, cut out circles in the dough. Bake the cookies 6 to 8 minutes. Repeat with remaining dough. Let cool completely and lower oven to 225 degrees. Whip the egg whites to soft peaks. Gradually add the sugar and continue to whip until firm white peaks. Fold in the cocoa. Fill a pastry bag with a wide tipe wih the meringue and pipe on top of the cookie bases. Bake at 225 for 1 hour. Since it was rainy and damp I turned the oven off but kept them in with the pilot light after the hour was up so they could get firm and dry. 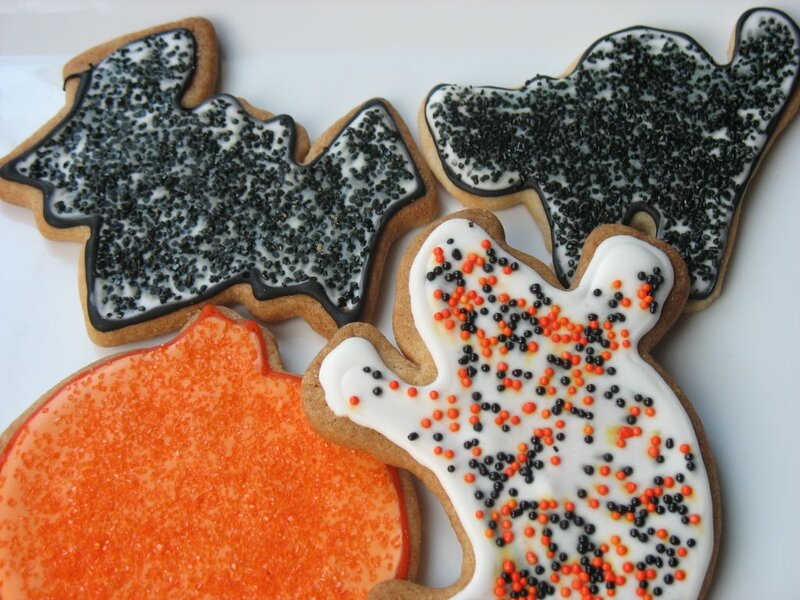 Using a 1 3/4 inch scalloped cookie cutter, cut shapes from the dough. 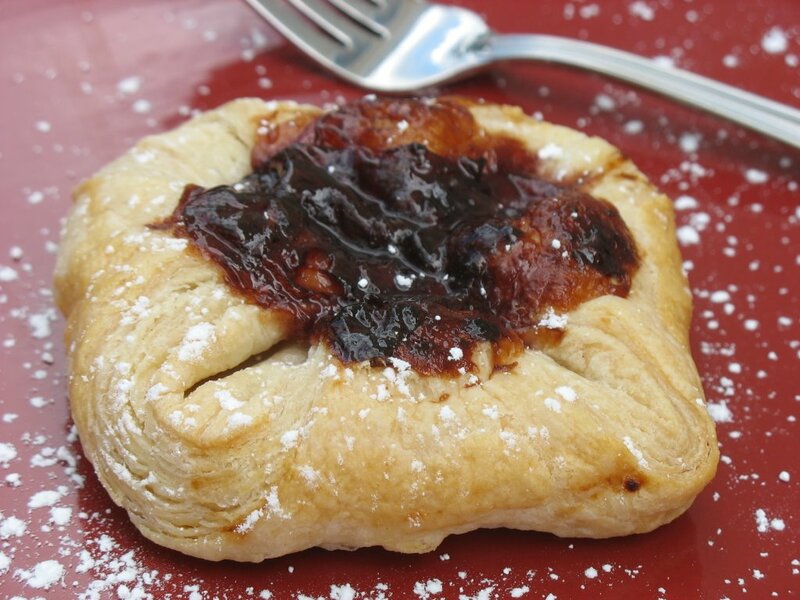 With a 3/4 inch round cutter, stamp each pastry center wihout cutting all the way through the dough. Space the circles 1 inch apart on a baking sheet and bake at 375 until golden brown, 15-18 minutes. Cool for 5 minutes and with a pairing knife remove the pastry circles marked in the center. Bring the sugar and corn syrup to a boil, and continue boiling until light caramel colored. Remove from heat and add the heavy cream at once. Do not worry if it foams loke crazy, it will settle down. Stir with a wooden spoon until completely smooth. Let cool completely. 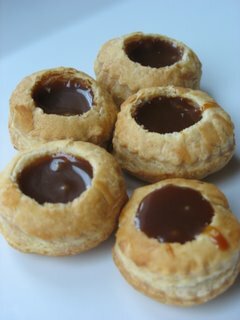 When the filling is cool, spoon into the pastry shell and let stand until ready to eat. 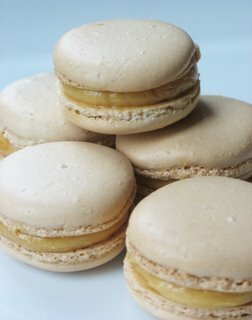 Last bite size dessert today: Macarons with Honey Buttercream. Sift the ground almonds and powdered sugar. In a stand mixer, whip 60 gr. egg whites to soft peaks, add 35 gr. sugar. In the meantime, in a saucepan on high heat bring the water and sugar for the syrup to 230 F. on a candy thermometer. Slowly add the boiling syrup to the egg whites and continue to whip on medium - high speed until they are completely cooled and you have a shiny meringue (10-15 minutes). Mix the remaining 60 gr. of egg whites and the sifted almond/sugar and carefully fold into the meringue. Fill a pastry bag fitted with a plain tip with the mixture and pipe macarons about 3 inches in diameter on parchment paper lined baking sheet. You can let them sit at room temperature for 20 minutes if desired. 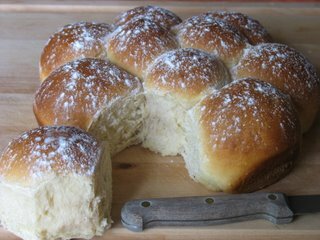 This is often done to assure those little feet at the bottom but I found that I can skip this step with this recipe and still end up with the same result. Bake at 320 for 15 minutes. Let cool. Whip the egg yolks until light and fluffy with a stand mixer. Combine water and sugar in a saucepan over low heat. Stir occasionally until the sugar is dissolved. Increase the heat and bring the syrup to 238 on a cansy thermometer. Pour over the yolks and quickly stir to combine. Return the bowl to stand mixer and whip at high speed until completely cold. Add the butter and mix in on medium speed. Add the honey and mix. Fill a pastry bag with the buttercream and layer your macarons with it. Refrigerate until ready to eat. And here is a picture of the 3 assembled on a tray. It is one of the only shots of the whole thing as they were quick to disappear. Sweet Happy Hour! You can tell I am digging those blog events, as seen in Grand Marnier Brulee in Egg Shells or Snow White's Apple. I realized the other day that it had been a while since my last few, weekly banana posts, especially so when B. (that's the hubby) handed me the fruit bowl with that heavy sigh : "please, do something, put an end to their misery, pleeeeeeze". I had to go teach a couple of classes so I put the dear bananas in the back of my mind. Later in the afternoon, we were outside with the rest of the neighborhood, and the kids (ages 3 to 9) were vividly talking about their Halloween costumes. Looks like we are going to have a fairy, a princess, a baby pumpkin, a skeleton, a couple of ghosts, a zebra and a tiger. We are trying to come up with a couple of games that could keep them entertained for a while as well as some fun foods that adults and kids can enjoy. That's when the bananas came to haunt me... 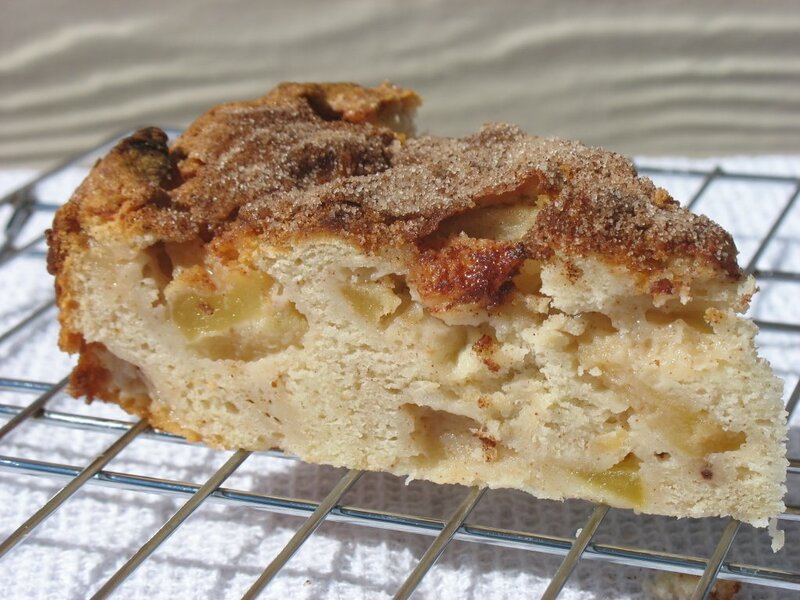 I remembered a marbled banana cake I had seen on the Cooking Light website when I was looking for the Apple Cinnamon Cake from the other day. I made it and baked them in mini bunt shapes. As soon as I took some next door, the kids exclaimed : "oh look! They look like Zebras! They look like Tigers" and that's how this marbled cake got a new name, at least around Halloween. Place chocolate chips in a medium microwave-safe bowl, and microwave at HIGH 1 minute or until almost melted, stirring until smooth. Cool slightly. Add 1 cup batter to chocolate, stirring until well combined. 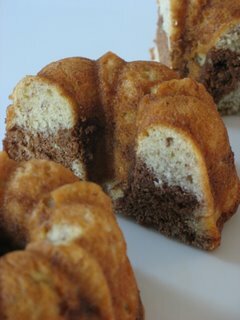 Spoon chocolate batter alternately with plain batter into an 8 1/2 x 4 1/2-inch loaf pan coated with cooking spray or mini bundt pans. Swirl batters together using a knife. Bake at 350° for 1 hour and 15 minutes or until a wooden pick inserted in center comes out clean. Cool 10 minutes in pan on a wire rack; remove from pan. Cool completely on wire rack. Since using smaller pans, they baked a little faster, more like 30-40 minutes, depending on your oven. They were great with some vanilla ice cream. Fall is Here! 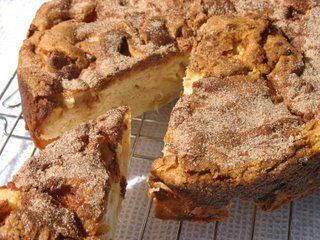 Apple Cinnamon Cake Too! You know how it happens... you wake up one morning and the ligh has changed, the cold air starts nipping at your nose and the landscape has changed! I wish the switch in seasons was that pronounced in the South Carolina Lowcountry but we are definetely not in summer anymore! My in laws went apple picking in the upstate a couple of weeks ago and were nice enough to make us a big basket of gorgeous, fragrant and delicious apples. They were so good at the first bite that I immediately decided I had to do something with them. Because of our activities this weekend (I do not recommend teaching Pilates with a hangover), I put those lovelies to the side and got myself covered in powdered sugar instead. Everything in the air today prompted me to make an apple dessert and I remembered reading about a Cooking Light recipe on a blog just recently. I can't backtrack my steps to the actual post or blog (as it happens often after a couple of hours browsing), but I did find the recipe on the magazine website and with so many great reviews I felt encouraged to try it, even or especially (depending on which way the scale dips today) if it is "light". The only changes I made were to use real butter instead of stick margarine. I am not being an hypocrite since I just admitted using some Crisco in my latest buttercream but I don't keep margarine in the house so butter it was, and regular cream cheese. I also only used 2 TB. of the cinnamon sugar called to top the cake prior to baking and not the 1/4 cup the recipe suggested. Result? Delicious! Strong but not overpowerig cinnamon flavor. I can't wait to try it with cardamom. Cooking spray. Preheat oven to 350°. Beat 1 1/2 cups sugar, butter, vanilla, and cream cheese at medium speed of a mixer until well-blended (about 4 minutes). Add eggs, 1 at a time, beating well after each addition. Combine flour, baking powder, and salt. Add flour mixture to creamed mixture, beating at low speed until blended. Combine 1/4 cup sugar and cinnamon. Combine 2 tablespoons cinnamon mixture and apple in a bowl, and stir apple mixture into batter. Pour batter into an 8-inch springform pan coated with cooking spray, and sprinkle with remaining cinnamon mixture. Bake at 350° for 1 hour and 15 minutes or until the cake pulls away from the sides of the pan. 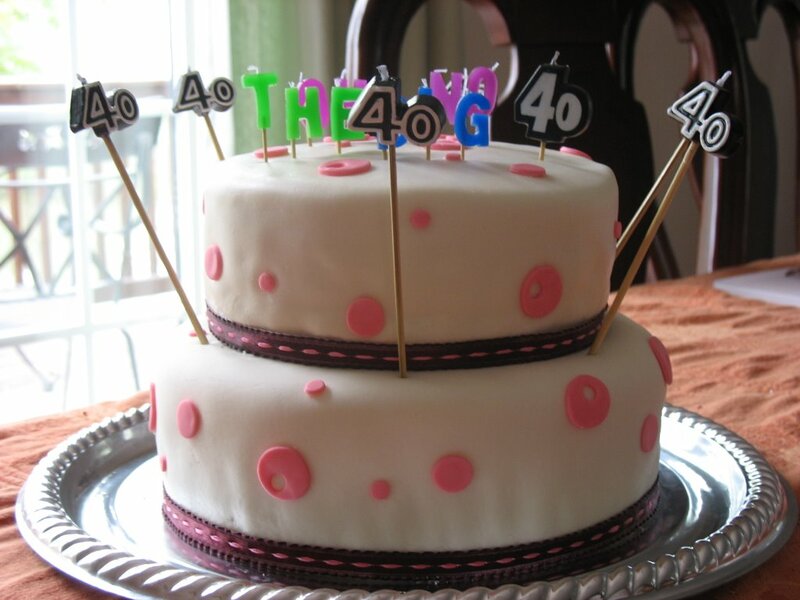 Cool the cake completely on a wire rack, and cut using a serrated knife. This cake is one of the reasons why I was away from this blog over the weekend. One of our neighbors turned 40 on Sunday and we all gathered to steam some oysters, eat some pulled BBQ pork, cheeses, drink a lot (like a truck ran over me 5 times already)and eat this cake. I made her a 2 tiered dark chocolate cake filled with cream cheese frosting and covered in fondant. I had a great time making it and it was a big hit. I can't believe we almost ate our way through the whole thing! I'll be back later for recipes and instructions. 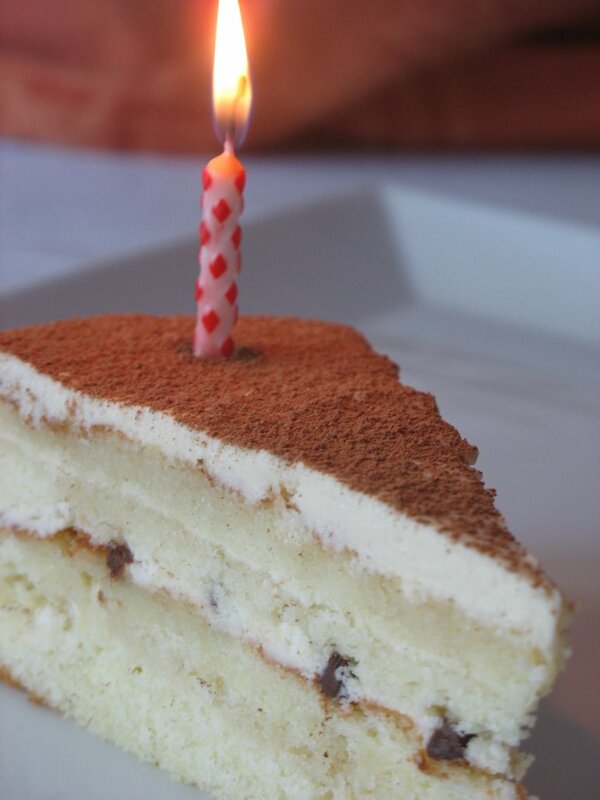 For the cake layers, I used this recipe I found on Lisa's blog, La Mia Cucina. I made 5 batches as I'd rather be on the safe side and I am OK with recycling what's left over. I made a couple of changes though. You can find her recipe here, below is the one I used. Sift together the flour, baking soda and salt. Set aside. In a large bowl, beat 1/2 cup butter and sugar until well mixed. Add eggs one at a time. Beat in the vanilla and melted chocolate. Add 1/2 c. of the sour cream and then 1/2 the dry ingredients to the butter mixture until well blended. Add the reamining sour cream and remaining dry ingredients to the batter. Stir in boiling water with espresso powder. Bake in a 9 or 10 inch cake pans. As I said I made 5 batches and I filled 3 10 inch pans and 2 8 inch pans. For the frosting I made 2 batches of the following recipe, and before you scream and send me to Pastry Hell, yes I used Crisco! I found that in SC where the humidity is very high 99% of the time, Crisco helps my buttercream set and prevent my cakes and fondant from sweating, shifting, and ultimately collapsing. I did use the trans-fat free one though. In stand mixer, cream Criso and cream cheese until very smooth. Add sifted powdered sugar and water. Mix until well incorporated. Fill and cover the cakes with this. Refrigerate until ready to cover with fondant. For the fondant, I usually go 2 ways: either I run around town and look for glycerin and glucose to make my recipe or I call C. who runs the pastry department at the restaurant across from the one I used to work for. She is my to go source when I am lazy and hers is always perfect. I decided to go another route this time again and decided on this recipe after seeing Monisha's cake last week. Amazingly easy and fun to make and so smooth to roll and handle, no tear which meant no tears for me saturday night when I used it. I made 2 batches since I plan on using some next week for another cake. For the dots I used pastry decorating tips and used the openings or bases to cut different size circles. It got so humid overnight and it rained all day long sunday, I started worrying as the fondant might sweat and stretch, get gooey or gummy and start chnaging the overall appearance of the cake. I think I was the only one to notice the little shifts and things but the birthday girl was extremely happy with it. It looked and tasted good, you would expect it to be sickenly sweet but it wasn't that much. So it was a shock full of sugar! Hey, it was a birthday after all! I guess I owe this to my upbringing but I am known in my family as the Queen of Recycling. At the restaurant, the executive chef and the owners loved me for that: failed cheesecake? No problem, we'll have cheesecake mousse in parfaits glasses! Leftover pastry cream? No problem, we'll have Bavarois! Dry chocolate cake? I'll pulverize it and use the crumbs for crusts, decorative crumbs or something...Hey! I could even use it in those parfaits glasses to layer my mousse with! You get the picture. Mind you, not everything got recycled, in spite of my best effort. I was reorganizing the pastry/baking drawer of my freezer the other day when I found some Sour Cream Pastry Dough that needed to be used by the end of the month. I had made a cheesecake for a friend during the week and had some leftover filling. I was also staring at a half jar of Blueberyy Tea Jelly which color looked like a gem stone in the sun. I had a vessel, a filling and a crown! 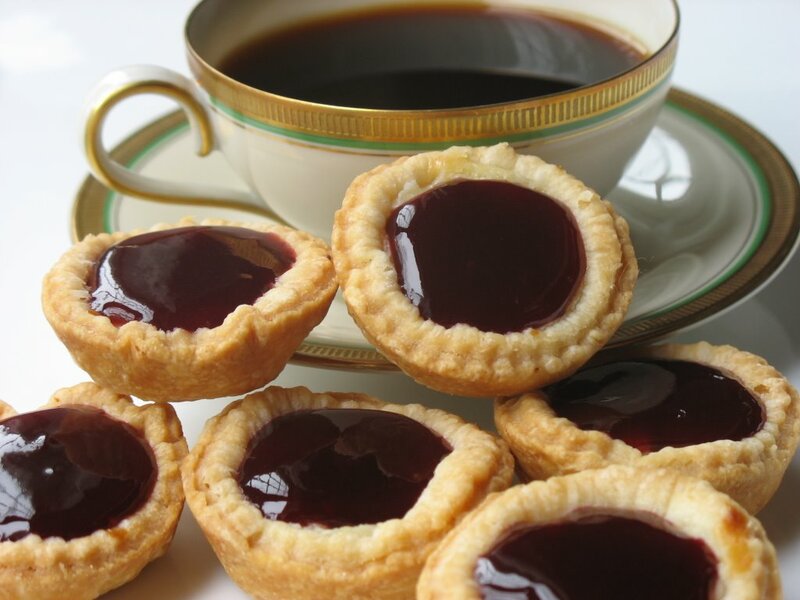 I had been craving small bites to go along my tea or my coffee in the afternoon so I decided to make tinsy mini tartlets using my min muffin tins. 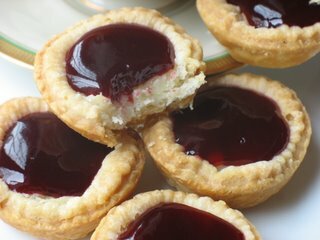 Sweet Cheese Tartlets with Blueberry Tea Jelly Crowns. 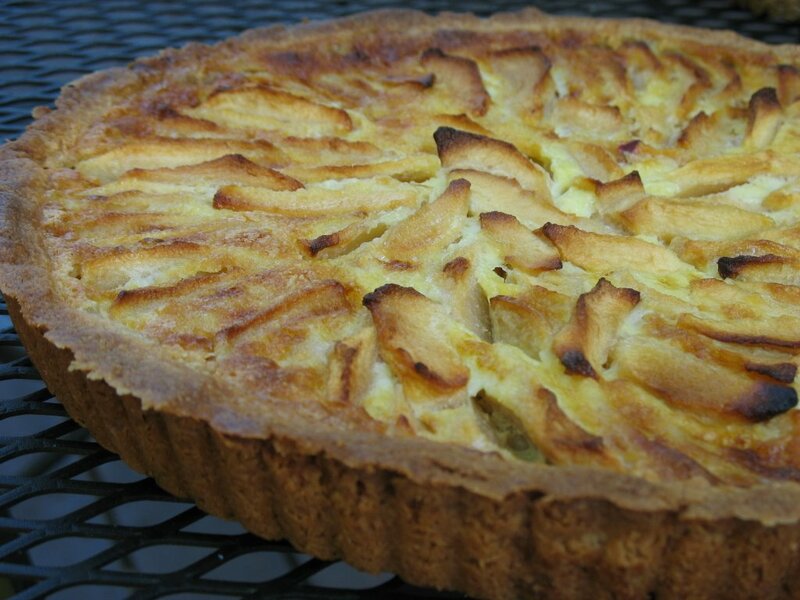 Sour Cream Pastry, adapted from Flo Braker's Sweet Miniatures. In a large bowl, combine the flour and salt. Add the butter and cut in with a pastry knife or your fingers until you get pea sized crumbs.Add the sour cream and blend in quickly into a ball. Don't over work the dough or it will be too elastic. Divide in half, wrap in plastic and refrigerate for 4 hours or overnight. In a bowl, blend the cream cheese and sugar. Add the egg and lemon zest. Blend well. Roll out the dough on a lightly floured surface and cut 3 inch circles. 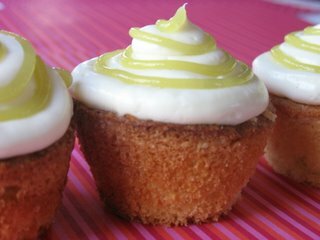 Fit them into the cavities of the mini muffin tin and divide the cream cheese filling evenly among them. Bake at 350, for 10-15 minutes. Let cool completely. Melt 1/2 cup of your favorite jelly. I used Blueberyy Tea that I made over the summer. Divide evenly on top of the tartlets and refrigerate until set. Make yourself a cup of tea or coffee and pop a few into your mouth! 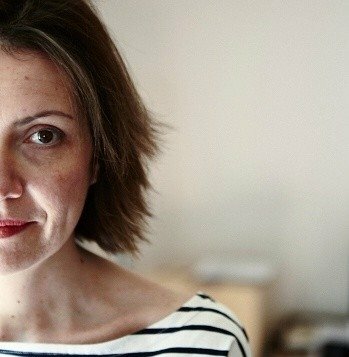 Today I learned that a friend had breast cancer. Today I learned that a family member had passed away. Today I learned of a couple getting married. Today I learned a friend had her baby. Sorrow and happiness were overwhelming and I dealt with them the only way I know how: I am not an emotion eater, I am an emotion baker. Faced with life's joys and pains my preservation system is to put on some music and get myself in the kitchen. I baked non stop this afternoon. I found myself wanting round small things, Fall flavors, butter, eggs: familiar things that I knew how to control.By the end of the day my apron was covered in sugar, my slippers dusted with flour, my kitchen sink overflowing with pots and pans. I was calmer, I was tired, I was happy. Did I make all these baked goods for us? No. You see, part of my emotion coping system is to make sure everybody else around me is well fed, hydrated, and happy. I packed some of the stuff in containers, got some milk and rang the neighbors' doors. That's when hubby said: "you are like the woman in the book you just read!" and then I knew I had my entry for Stephanie's Blog Party 15. The theme this month was to make something from one of our favorites books. I baked a recipe for a cake I found in this book I just finished, Eat Cake, by Jeanne Ray. I know she said an appetizer and a drink but I blog about sweets, so I hope she'll accept my entry as a "if you still have room for dessert" one as far as the cocktail part, there is rum in the glaze! Although it is not my favorite book, it is an easy read and I found a lot of similarities with the main character. When faced with difficult decision or stressful situation, Ruth calms her nerves by picturing herself inside a cake. She then proceeds to bake one and gives ot to her family or friends. This afternoon I was Ruth by making one of her famed cakes. 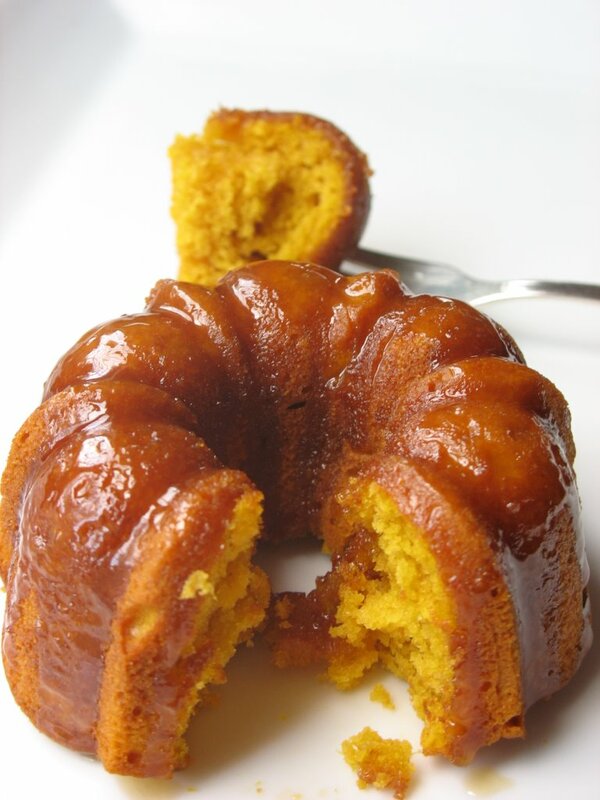 The author was gracious enough to include the recipes for the featured cakes at the end of the book and I picked the Sweet Potato Bundt Cake one, minus the raisins as my husband dislikes them, and made mini ones. Preheat oven to 350. Grease and flour a mini bundtcake pan (used twice) or one large pan.In a large bowl of stand mixer, beat the eggs a little to break them up. Add the sugar and beat 2 minutes until thick and pale. Add the oil and vanilla. Add 1/4 cup rum and sweet potatoes. Mix thoroughly. In a separate bowl, sift the flour, baking powder, baking soda, cinnamon and nutmeg. Add the flour mixture to the batter in 3 additon, alternating with the buttermilk in 2 additions, beginning and ending with the dry ingredients. Divide into the pan cavities and bake for 30-45 minutes. Cool for about 10 minutes, invert onto a cooling rack set over a baking sheet to catch the excess glaze. Combine 1/2 cup dark brown sugar (I used light), 4 Tb. butter and 3 Tb. whipping cream in a saucepan over medium high heat until it comes to a boil. Continue to boil until it thickens a bit, about 3 minutes. 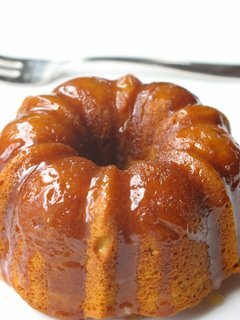 Remove from the heat and add 1/4 c. remaining rum.Poke holes in the cakes with a skewer and spoon the glaze all over the cakes. Wait 15 min utes. Scoop the glaze that has dripped into the baking sheet and repeat the procedure. 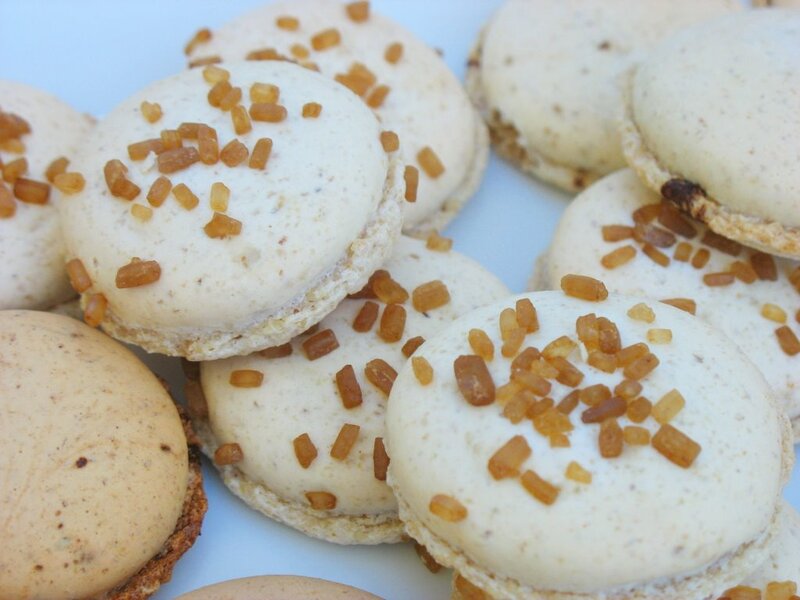 Well, the macarons are just going to have to wait because today is one of my new favorite days: World Bread Day! I don't really need an excuse to celebrate bread but it is sure good to stop and smell the grains once in a while. Thank you Zorra for launching this event! When I first moved to the US, one of my first quests was to find a decent bakery in downtwon Charleston, preferably specialized in European breads. I was not being a snob, just too far away from home for comfort and trying to find familiar foods and ingredients. That lasted for about a month...every visit to the grocery store or farmer's market was teaching me more and more about local specialties. It is also thousands of miles away from home that I became more acquainted with other cultures' foods, isn't that ironic? I ate more lasagna, empenadas, kebabs, bagels, pastillitos, curries in one year than I had in 20 years in France. My senses were awakened and my horizons expanded everytime I would open my mouth and eat. Isabel lived in the downstairs apartment and she was a beautiful, graceful woman in her fifties. She loved and lived to cook and the smells coming from her kitchen were enough to make everyone miss the sidewalk passing under her window. My room was right above her kitchen and the wonderful aromas of freshly baked breads and pastries were an awful distraction. I remember taking my books to her apartment and lying in the hamoc while she was mixing, kneading, swirling...If I were a man I think I would have had the biggest crush on her. She spoke Portuguese all the time so that nobody would disturb her, but one day I begged for hours on hand for her to speak English long enough so I could copy down her Portuguese Sweet Bread recipe. It is similar to a brioche but less buttery and the consistency is a little bit denser. I love making it and freezing half for French toasts on sundays. Preheat oven to 350 degrees. Dissolve yeast in warm milk and add the sugar, butter and salt; stir until butter is melted. Add the eggs, previously beaten slightly.Add 1/2 the flour to the milk/sugar/butter/salt, and mix until smooth. Continue to add remaining flour to make soft dough. Remove it from the bowl and place on floured board. Knead until smooth and satiny (about 15 mins.). Shape into a ball and place in buttered bowl. Cover and let rise until double in size (2 hours). Punch risen dough down and divide it in 10 pieces Place in a greased pan (8-9 inches round). Let rise in warm place until double in size (1-1/2 to 2 hours). Bake in 350 degree oven for 20 minutes or until golden brown. Too tired to post tonight after the Hub's family shinding, but tune in tomorrow for World Bread Day. This is what my parents were supposed to have for breakfast this morning....but I forgot and pulled a brioche out instead...so next time they come I will do these pastries again. I drove my parents to the airport earlier this afternoon. Every time they come we have a different experience depending on where we are in our life, but it seems like they had a nice visit. There was quite a good amount of wine poured and food enjoyed. There was laughter and sight seeing, a good deal of shopping for the rest of the family. Some clashes did take place, some strong opinions were exchanged, some things were left unsaid. Each time I wait with them under the Arrival/Departure screen I cannot help but feel a pinch in my heart. I wish I had not said some of the things I reacted to or hugged my mother more instead. Such is life and human nature, I guess. I feel like each time they come I am 16 again, but has grown 10 years by the time they leave. They help me remember who I am and help me get better at the same time. I have wonderful parents: je vous aime Papa et Maman. One habit they have started for my brother and myself is to load up the fridge and freezer before they leave..."just to help, you know". Their reason is that we provide lodging and transportation and deal with them for 3 weeks. They are the easiest guests to have around! I appreciate them funding my foodie and blogging tastes and take this opportunity to get some lamb, cheeses, blocks of European butter, free range chicken and eggs and other delicacies that I usually try to budget for. Before we headed out on our (big) food outing I noticed I was out of a few staples, especially puff pastry. Mom suggested we buy some at the store ...oh boy! you should have seen the look on my face! 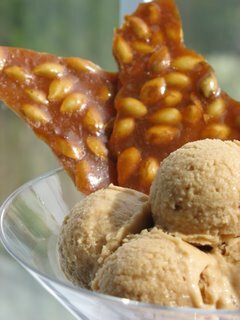 It costs nothing to make, only time and a few dough turns on a rainy afternoon while watching your favorite old movies. She gave me "the" look : proud, shocked, worried.... Had I turned into Martha Stewart? 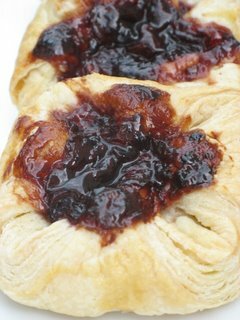 See, it really makes me mad to buy puff pastry when I know how easy and unexpensive it is to make at home. I usually make a big batch and divide it in 4 so I know I'll have plenty for a while, vaccuum seal it and freeze it. I decided to try a new recipe for a change and did, indeed, for the time of recipe turned into Martha by using hers. It is very straightforward and easy but I somehow prefer the one I usually use from Bo Friberg. 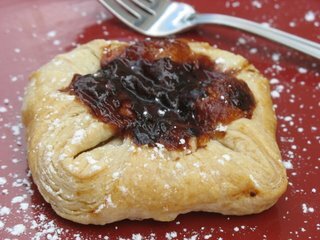 I decided to use some right away and got inspired by Cheryl wonderful pastillitos, and folded square of puff pastry and put some cherry preserves in the middle. Make the dough package: In a large mixing bowl, combine both flours with the salt. 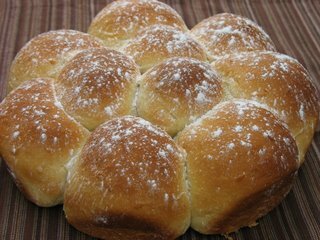 Scatter butter pieces over the flour mixture; using your fingers or a pastry cutter, incorporate butter until mixture resembles coarse meal. Make the butter package: Sprinkle 1/2 tablespoon flour on a sheet of waxed or parchment paper. Place uncut sticks of butter on top, and sprinkle with remaining 1/2 tablespoon flour. Top with another sheet of paper; using a rolling pin, pound butter to soften and flatten to about 1/2 inch. Remove top sheet of paper, and fold butter package in half onto itself. Replace top sheet of paper, and pound again until butter is about an inch thick. Repeat process two or three times, or until butter becomes quite pliable. Using your hands, shape butter package into a 6-inch square. Wrap well in plastic wrap, and place in refrigerator until it is chilled but not hardened, no more than 10 minutes. Assemble and roll the dough: Remove dough package from refrigerator, and place on a lightly floured work surface. Using a rolling pin, gently roll the dough into a 9 inch square. Place butter package on the center square. Fold corner of dough over the butter package so that it is completely enclosed. Press with your hands to seal. Remove dough from refrigerator, and repeat process in step 5, giving it five more single turns.Always start with the flap opening on the right as if it were a book. Mark the dough with your knuckle each time you complete a turn to help you keep track. Chill 1 hour between each turn. After the sixth and final turn, wrap dough in plastic wrap; refrigerate at least 4 hours or overnight before using. For the pastry: cut the dough into 4 inch squares, fold the corners to the centher, create an indentation, brush with egg wash and fill with your favorites: jam, cream cheese, curds, etc...Bake at 350 for 30 minutes. My father loves cheesecakes as much as he loves crabcakes. He is getting used to (not to say tired) to the latter but will probably never lose his sweet tooth for a creamy slice of cheesecake. Usually he would come into the restaurant and order a slice of the one I had prepared that day. He was always curious of my combinations or fillings, whether it be fruits, liqueurs or curds. My parents have been visiting for almost three weeks and I realised Friday that I had not made one for him yet. It is really no big deal for me to make one, I have used the same recipe gazillion times and even tired after a long outing I really don't mind baking one. When I asked him about what flavor he wanted, he simply answered "coffee". What? no extravagant or decadent concoction? No. Just coffee. Allright, as a good daughter I would oblige but only if I can use real espresso and some Kahlua. I can't tell you where the original recipe comes from, it is a sort of "I got it from a chef who got from a chef who got it from a chef" kind of story. I love it because you can use the fillings and toppings of you choice and you can be as creative as you wish and it never cracks or fail. Coffee Cheesecake, original source unknown. Mix the butter and cookies and pat them into a springform pan, previously lined with parchment paper. Mix together the cream cheese and sugar until well blended. Add the eggs, one at a time an mix well after each addition. Add the espresso and liqueur. Pour into prepared pan. Wrap the pan with foil and set it into a large roasting pan, fill halfway with water and bake at 350 for 30-40 minutes, the middle needs to be wiggling a little. Remove from water and cool completely. Better made the day before you plan to serve it. To remove the cake from the springform bottom, invert on plastic wrap, using a hair dryer or a blowtorch, heat the inverted pan bottom. 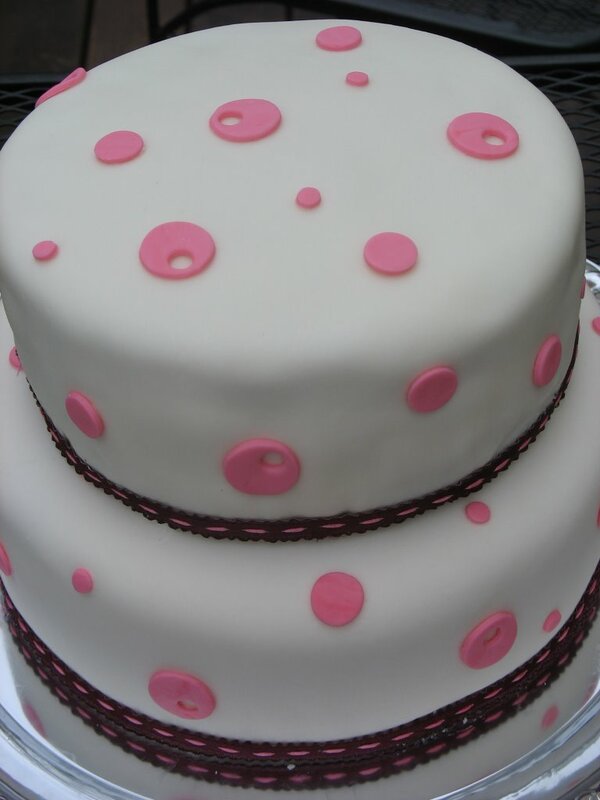 The cake should losen up from the base. Remove the bottom and invert the cake onto a serving plate. Discard the plastic wrap. Note: I had a wonderful visit with Cheryl and Griff in Savannah, and plan to post about it soon, I just want to make sure the are allright with the pictures I took. 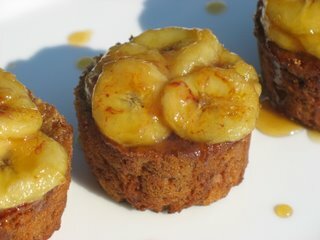 These little things are really not supposed to be muffins but rather banana bread. Anybody who knows me also knows that I love things that should not be what they are intented to be. I like to twist and divert, although never to the point of creating a diplomatic incident! 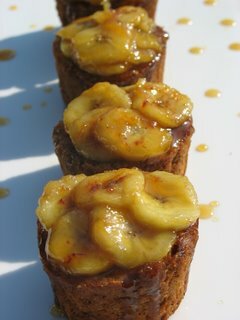 I have made this recipe so many times to use up over ripe bananas that I don't need to open the cookbook anymore. I thought that for the sole purpose of practicing my photography, the batter could be turned into little cakes and decorated for a nice photo shoot. I also have to confess that with my family still visiting, my recipes have to remain simple and easy to assemble because we do a lot of sightseeing and shopping. However, I would not want to make you miss your weekly episode of the "Banana Post"!This original recipe comes from Cooking Light and is quite easy and light, but full of flavor. I adapted it by adding some rum and replacing the milk with buttermilk. I sometimes add nuts or coconut, sometimes mini chocolate chips. Preheat oven to 350°. Line muffin pan with cupcake liners and spray with cooking spray. Combine sugar and butter in a bowl; beat at medium speed of a mixer until well-blended. Add banana, milk, sour cream, and egg whites; beat well, and set aside. Combine flour, baking soda, and salt; stir well. Add dry ingredients to creamed mixture, beating until blended. Divide evenly among the muffin tins and bake for 20-25 minutes. Slice 3 bananas. Melt 1 TB butter in a large saute pan and saute the bananas until they start to get some color. Add 1/4 to 1/2 cup of good honey. Remove the bananas and let the honey reduce some. Divide the banana slices on top of the muffins and drizzle with the honey. I probably won't be around much this weekend as we are going down to Savannah to play tourists and stroll around town. No visit planned to see Paula Deen, but I am definetely going by the Back In The Day Bakery to see Cheryl. Yeah!! Well, obviously I can't be trusted! I said a few days ago that I was done with citrus for a while and there I go again! I was reading one of my favorite blogs, What's the recipe today, Jim?, and there it was in plain view: a decadent looking Iced Lemon Curd Layer Cake from Delia Smith. Instead of making one cake, I poured the batter in muffin tins. I also adapted the recipe by replacing the lemon curd for lime curd. 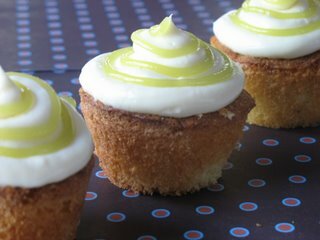 I did a simple cream cheese frosting instead of a glaze and pipe more lime curd on top. I basically only kept the main body of the recipe, the cake. It has a nice light crumb . Just measure all the cake ingredients into a mixing bowl and beat – ideally with an electric hand whisk – till you have a smooth, creamy consistency. Then divide the mixture evenly between the muffin tins and bake them on the centre shelf of the oven for about 35 min. While the cakes are cooking, make the lemon curd.Place the sugar and grated lemon zest in a bowl, whisk the lemon juice together with the eggs, then pour this over the sugar.Then add the butter cut into little pieces, and place the bowl over a pan of barely simmering water. Stir frequently till thickened – about 20 minutes. Remove 2 Tb. to decorate. 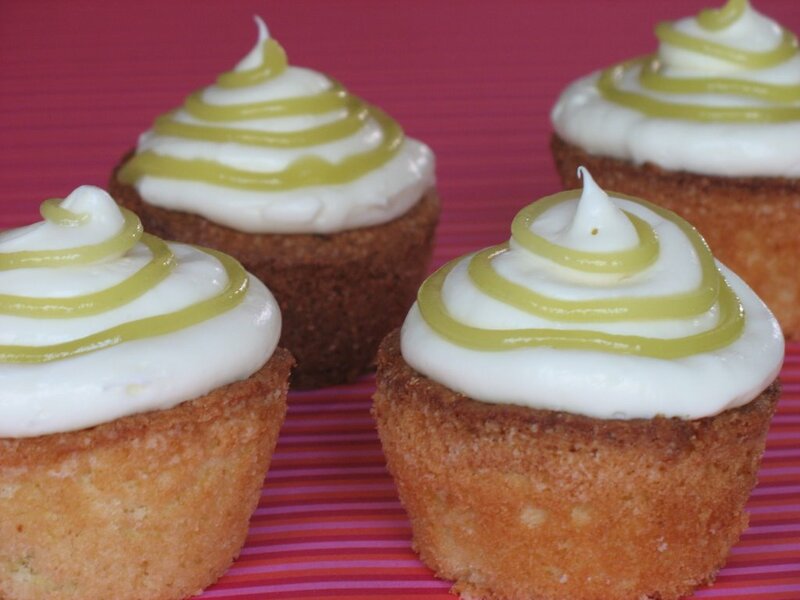 When the cakes are cooked, remove them from the oven and after about 30 seconds turn them out on to a wire rack.When they are cold, cut a hole in the center of each mini cake, fill with lime curd and put the lid back on. Cream the cream cheese and butter, then add the powdered sugar and juice. Frost the mini cakes with it and pour the remaining 2 Tb. of lime curd in a pastry bag fitted with a small tip, drizzle or swiggle over the frosting. This past weekend, one of our friends came in to visit after a 5 year abscence. It was great seeing him and going out around town, but it was also his birthday and I wanted to mark the occasion. 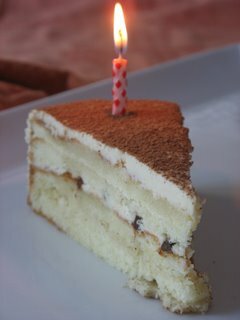 I was still browsing through Dorie Greenspan's book when I noticed a recipe that really caught my eye: Tiramisu Cake. I love mascarpone and my dad loves tiramisu, so it struck me as a winner. We had decided to grill some steaks, roast potatoes and vegetables and I was afraid that it would be too heavy. On the contrary, it was light and creamy, not too rich but definetely decadent! I am amazed that everything that I have made so far has came out so light. 1 1/4 sticks butter at room temp. Sift together flour, baking powder, baking soda, salt. In a mixer, cream the butter and sugar. Add the eggs one a time, plus yolk, beating well after each addition. Reduce the mixer speed and alternatively add the flour mixture and the buttermilk. Begin and end with the dry ingredients. Pour into 2 greased 9 inch baking pans, and bake at 350 for 30 minutes. For the espresso syrup: mix together 1/2 cup water and 1/3 cup sugar in a saucepan and heat just to a boil. Remove from heat and add 1 Tb. coffee liqueur. Cream together the mascarpone, sugar vanilla and liqueur in a large mixing bowl, until smooth. In a separate bowl, whip the heavy cream to firm peaks. With a light touch, fold the cream into the mascarpone mixture. To assemble the cake: Remove the crowns of the cakes to make them flat (sorry Sam), place one cake on a plate and soak the layer with the espresso syrup. Smooth some of the mascarpone cream over, gently press the chopped chocolate on top of it. Top it with the other cake, pour the remaining of the espresso syrup. For the frosting, dissolve 1 tsp. espresso powder and 1 tsp hot water and add to the remaining mascarpone and spread over the side and top of the cake. Decorate with dusted cocoa powder if wanted. It's been a crazy weekend with my parents being here and a friend coming in town for his birthday, but I did manage to get a couple of desserts done. I might be an irregular poster in the coming week but I'll do my best. We are trying to pack so many activities into each day, it leaves little time for baking and blogging. I enjoy each moment I spend with the family and appreciate my own culinary background even more when I find myself making dough and peeling apples next to my mo ir making rice pilaf with my dad. We were invited to my in-laws for dinner this weekend and as always I volunteered dessert. I still had plenty of apples left from the bag I used for Blog Party 14 and an apple cake, so the choice was obvious. As I am completely immmersed in Dorie Greenspan's book, I first looked there for an apple dessert. 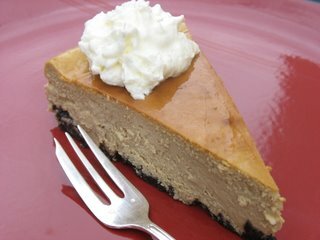 There are so many yummy recipes that my head started spinning, not only from the recipes but with all the options added on the sidebar. 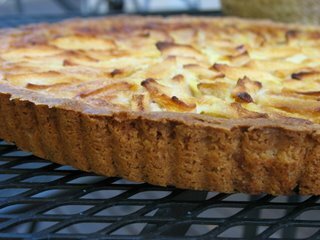 I decided upon the Alsatian Apple Tart as I wanted a creamy base. I just added a splash of Calvados (apple brandy from Normandy) to the cream and used the Sweet Dough recipe with ground walnuts. Our meal was fairly substantial, mostly based on seafood but the tart was not diffficult for anybody to enjoy because it is light and smooth and goes down like a charm! In a food processor, combine 1 1/4 cups flour, 1/2 cup powdered sugar, 1/4 cup walnuts and 1 stick of butter, pulse until it ressembles coarse meal, add 1 egg yolk and pulse until combined into a ball. I flattened it into a disk in between sheets of plastic wrap, refrigerated it and rolled it out to cut rounds big enough to fit into my mini tart pans. The dough gets soft very fast so you can flour your fingertips to push it up and down the sides and bottom of the pan. Layer the apples on the bottom of the dough. In a bowl, mix the eggs and sugar, add the cream and the liquor. Pour on top of the apples and bake at 375 for 50-55 minutes. How easy can this be?! It was delicious!